This is the fourth edition of this visualisation, previous editions were in June 2014, October 2013 and December 2012. But, where is the Oxford Nanopore MinION? The Oxford Nanopore MinION is a bit tricky. My metrics are based on company specifications that anyone can view from their website, for commercially released instruments and (chemistry) updates. The commercial release of the MinION seems now to have happened, as it was announced everyone can apply for the MinIon Access Program and will be accepted (barring some sanity screening they probably will do). But metrics for this instrument are a different matter. There are no company specs that I can find. Partly this is understandable, as read length, for example, is dependent on the input length of the sample (or library, rather). The other reason for the lack of specifications may be the Minion Access Programs philosophy of Oxford Nanopore. It is the users that are discovering what the instrument can do, rather than the company telling the customer what to expect. For my visualisation, this lack of specification causes a problem, as this makes it impossible to point to a source for where to place the MinION on the plot. Hence it is lacking from the figure above. the Complete Genomics/BGI Revolocity is missing from the figure, also since there are no company specifications on the Complete Genomics website. There is as of yet not enough information to try to piece together what the metrics are, all that is known is that the read length is 28 bp paired end. Data and figures are released under a CC0 license at figshare, with doi 10.6084/m9.figshare.100940. I’ve also added the content to Github at https://github.com/lexnederbragt/developments-in-next-generation-sequencing. As before: although I took utmost care in collecting the data, I may have gotten some of my numbers completely wrong, for which I apologise in advance; please help me correct any mistakes or omissions through leaving a comment, or sending me a pull request. Sources: see this file from the github repo. This entry was posted in Next Generation Sequencing and tagged 454, GS FLX+, GS Junior, HiSeq, Illumina, Ion Proton, Ion Torrent, Ion Torrent PGM, MinIon, MiSeq, NextSeq500, oxford nanopore, pacbio, sanger, SOLiD. Bookmark the permalink. Very nice and thank you for the update. For this “certain new instrument”, given your explanation as to why it is *not* included in the first plot, I was wondering if you might not want to also include the “big sibling/army” of this “certain new instrument”, i.e., the PromethION? 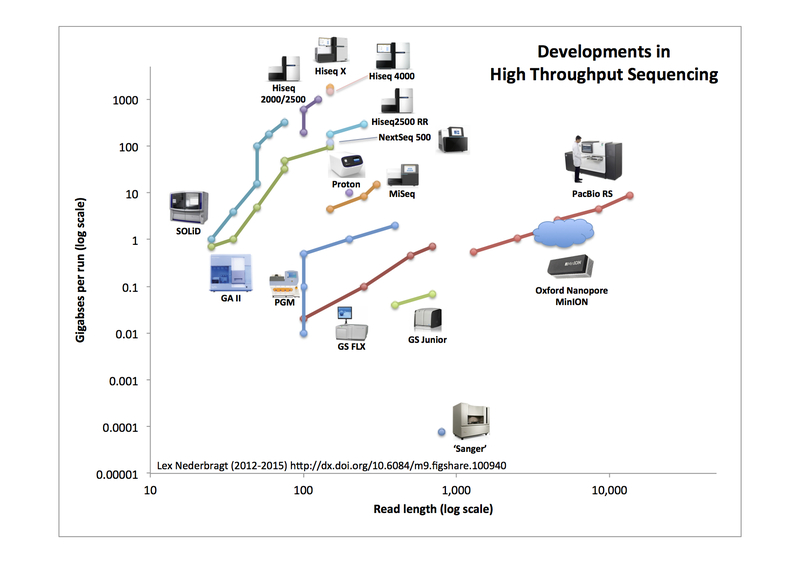 Albeit with putative numbers of course, something along the lines of https://www.genomeweb.com/sequencing/oxford-nanopore-presents-details-new-high-throughput-sequencer-improvements-mini -> “throughput could increase to more than a terabase per day”. Also, for older instrument the definition of “run” is slightly different… smaller instruments (31xx) can hold 2 x 384-plates whereas the big instruments (37xx) have an autosampler that can hold up to 12 x 384-plates. If by “run” we mean a single capillary injection (~30min run time) then number of reads/run is equal to the number of capillaries… However if by “run” we mean a session without any hands on time then the throughput goes up significantly. (i.e. 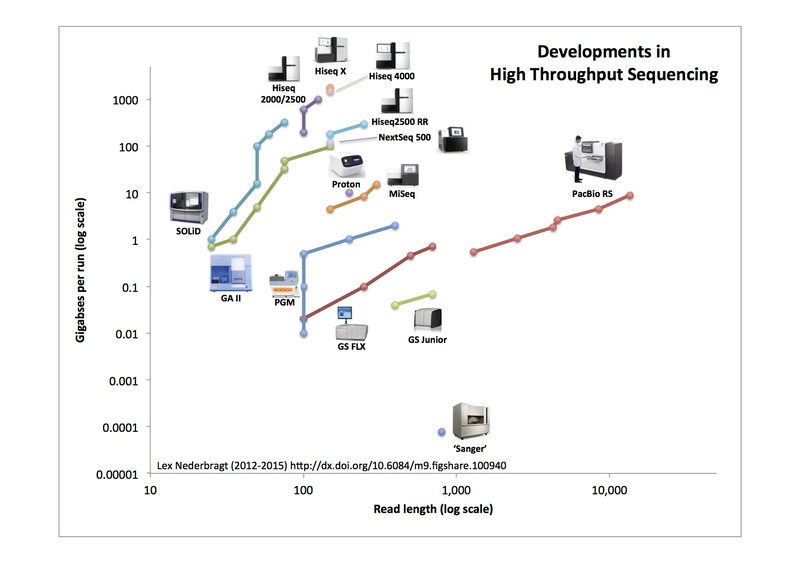 3730xl processing 12 x 384 plates would generate 4608 individual reads and if we assume 800bp we have almost 3,7Mbp output, still tiny compared to NGS but not as low as the picture suggests. Fantastic – where are you references btw? It would be incredibly valuable to have some cost metric associated with these data as well. I suspect it would be even more difficult to come up with hard numbers there since it will vary on institution, library prep etc, but there must be some way of consistently calculating it, right? For the PacBio data, do you know if these are these figures based on “raw” (polymerase) reads, or “usable” (sub)reads? Thanks for the continuous updates. I have been following this since the first edition, looking forward to the next edition. Thanks (had seen that already). I will use that information for the next edition!